We have received our first entry for the contest! I asked Vonna if we could post her sampler here and she graciously agreed. The following note tells a bit about her entry. "Recently I’ve been thinking a lot about my Granny. Her maiden name was Eileen Campbell. She loved rusty coral colors, so I stitched my sampler and dedicated it to my Granny. I used DMC colors: Light Value 3830, Medium Value: 355 and Dark Value: 3777. I stitched it on my own “bake and basted” 28 ct. coffee/tea stained linen. I think it turned out just lovely. I didn’t make any of the “school girl” mistakes in the pattern because one thing about my Granny was she was a perfectionist and in her stitching every thing had to be perfect!" You can see more pictures on her blog spot. Click on her name above and you will be magically directed there. What a wonderful way to remember your Granny! I know she would love seeing her name stitched into your sampler Vonna. Vonna you are now officially entered into the contest! Barb and I are getting ready to leave tomorrow so don't forget ....we will be shopping! If you haven't seen about the contest check the April 14 post. What a nice way to finish this sampler!! Just wonderful, I love the personal story. Oh, how pretty! I'll have to get going on my version this weekend. Well done, Vonna! It's really pretty. Wow, Vonna has stitched such a lovely tribute to her granny. Seeing this made me think how nice it would be to dedicate this sampler to someone special and, as we celebrated my MIL's 100th birthday this week, I can't think of a nicer occasion to dedicate it to. 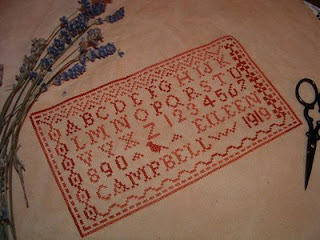 I think the date 1909 would look perfect on this sampler. Wow, that was fast stitching! I check your blog every single day. It's one of my favorite. Please keep up the great work! As always Vonna has produced a stunning piece! Great idea to use her grand-mother's name and date of birth. Now if only I knew my grand-mother's DOB! I'm working for an educational design company and your ideas would be just perfect for our conception. This method is chosen due to the fact that one of the integration limits needs to be taken. The third part of the program is intended to write my essay for me fast and introduce the boundaries of integration and accuracy of the calculation.